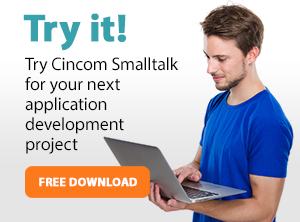 The success of Cincom Smalltalk™ is largely due to the many people behind the scenes. Suzanne Fortman, the Director of Smalltalk Global Operations, for business questions about Cincom Smalltalk. Arden Thomas , the Product Manager for Cincom Smalltalk, for questions about the Product Roadmap. Jeremy Jordan, the Sr. Creator of Opportunities, to share a story regarding how you use Cincom Smalltalk or to network with us.